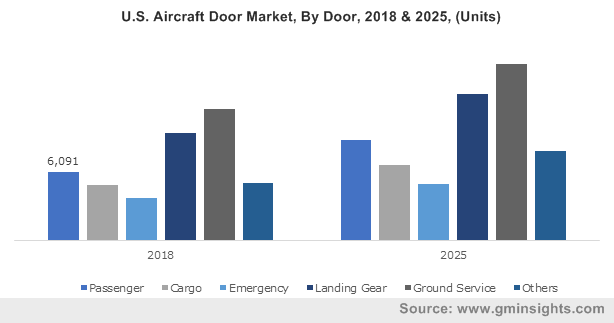 The exponentially growing air passenger traffic & subsequent rise in the number of aircraft fleets are expected to drive aircraft door market size in the many years to come. According to a 2017 report from the International Air Transport Association (IATA), the number of passengers travelling by air reached the 4 billion mark, demonstrating a rise of more than 8% when compared to the numbers from 2016. While attempting to meet the increasing air traffic demands, aircraft manufacturers worldwide are also increasingly focusing on effectively reducing the overall weight of their respective aircraft fleets in an effort to enhance the airplane’s fuel efficiency, that would serve to further enhance the growth prospects of the aircraft door market globally. Apart from aircraft manufacturing companies, several government entities are also launching different initiatives to make the industry less taxing on the environment while making air travel safer by prompting adoption of more innovative materials in aircraft manufacturing processes. For instance, back in 2014, the European Union backed a research effort to incorporate carbon nanotubes to manufacture extremely lightweight, durable structural parts that reduce the overall weight of the airplane by as much as 20 percent. Commercial aircrafts are the most common type of aircrafts persistent in the aviation space presently. The demand for commercial aircrafts is quite overtly, dependent on the number of passengers travelling by air and with the International Air Transport Association (IATA) estimating that the number of passengers would be reaching the 7.8 billion mark by 2036, aircraft door market is anticipated to record substantial gains from the commercial aircraft segment. Not to mention, even CAPA estimated in 2017 that commercial airline deliveries hit 31,000, depicting an upsurge of 4% compared to 2016. Attributing to the nature of their service, commercial airplanes are also subjected to significant wear & tear over their tenure, with the aircraft doors being one of key areas that are susceptible to wear, fatigue and corrosion. On these grounds, the demand for sturdy yet lightweight doors from commercial aircraft companies has surged tremendously in the recent years. As per estimates, commercial aircrafts accounted for more than 45% of the global aircraft door market share in 2018 and are expected to garner a prominent proportion of the industry revenue in the forthcoming years. Air cargo transportation has become extremely vital across the globe, subject to the rise in worldwide trade and the improving global economy. In early 2018, the IATA estimated that the value of different goods transported by airlines that year would be surpassing the $6.2 trillion mark, representing over 7.4% of the world’s GDP. Air cargo has thus become an essential factor facilitating convenience, owing to which several companies across a plethora of industries depend on the global air cargo supply-chain. With the IATA claiming that in 2018, air cargo transportation crossed 60 million tons by volume, depicting an upsurge of 4.5% compared to 2017, it is rather vivid that the air cargo transport industry holds tremendous momentum. The sector also accounts for more than 35% of the global trade in terms of volume, that further validates the importance of cargo doors in the aviation sphere. As the air cargo transport industry continues to expand, the requirement of installing, repair, and maintenance of an array of different cargo-specific doors on the several existing & upcoming cargo airplanes will exhibit a meteoric rise, majorly expediting the commercialization scale of aircraft door market from cargo door. The Asia Pacific is anticipated to emerge as one of the most proactive grounds for the expansion of the global aircraft door market, given sheer volume of air passenger as well as air cargo traffic. According to a report by the IATA, an airline industry performance survey found that in 2017, APAC carried the largest number of passengers, over 1.5 billion individuals, experiencing a 10.6% rise against the 2016 numbers. Moreover, the survey also found that the top five international as well as regional passenger airport pairs were from the APAC region. Driven by the exceptional pace of air passenger traffic in tandem with the advent of low-cost air carriers, APAC aircraft door market share is anticipated to soar to new heights, enabling the region to emerge as a major regional industry contender over 2019-2025. The aforementioned trends quite overtly, signify that the global aircraft door market is slated to draw in significant gains in the years ahead. In fact, according to Global Market Insights, Inc., aircraft door market is expected to surpass a valuation of more than $9.5 billion by 2025.